July fourth is one of those holidays we look forward to every year. Whether it’s a weekend long camping trip, a road trip to another state or just enjoying a backyard barbecue and campfire. Every family has their own tradition. Spend some time with our family over this fourth of July! Good All-American time in Orofino, Idaho. 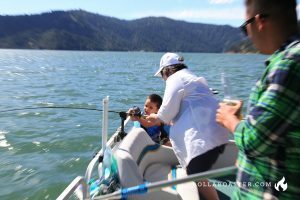 Here’s a few of the things we did for last 4th of July and give you some new ideas for times with friends and family over this great summer holiday! Sometimes we can go years without seeing our best friends. For us we try to make it only 2 years max. This past year some of our best family friends that we originally met in Hawaii were in Seattle for the summer so we invited them to come check out our town for the 4th of July. 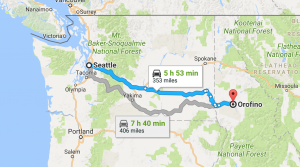 It’s only about a 7 hour drive over from Seattle its well worth it especially if you’re planning on doing any more summer road tripping to Montana, it’s right along the way. This part of Idaho is one of the most uncrowded and non-touristy spots in the nation, we’re willing to share a few pieces of our paradise with you, since you’ve taken the time to read. Even when we were young we spent time out on the lake so this year we decided to pass the tradition on. Usually at Dworshak Lake has a full pool until right after the 4th of July and many campsites along the water.We didn’t camp this year but still spent every day up on the lake. 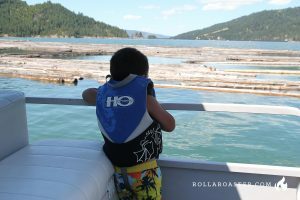 The kids got to play in the water and us adults tried to carry on the tradition and epic lumberjack sport of log running. 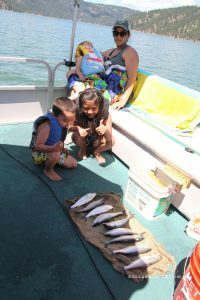 We were fishing for Kokanee constantly, we caught about 10 Kokanee a day and were able to have fish for dinner. Maybe one day we will give the secret recipe he uses for cooking the fish on the grill. No we don’t roast them on the Rolla Roaster. However we might try that one day! Since many of us have our Hawaii roots and traditions we decided to have kokanee sashimi, in this case that means raw fish straight from the lake. We made a special soy sauce seasoning. I don’t suggest this because it could be not recommended by the food safety board. Once we didn’t even wait to get home to eat fish, after cleaning the fish on the boat, we had the sauce along and ate sushi right there, not all of us just the most adventurous foodies. 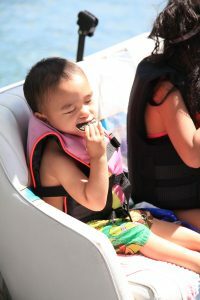 The kids thought we were crazy but they were happy to just eat Oreos, even while sleeping in some cases. Theres something special about seeing the whole town come out to celebrate at the park on holidays like these. 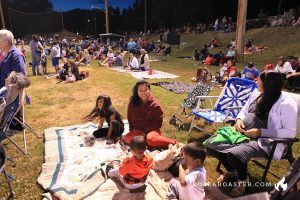 Every fourth of July it’s great to see the Orofino Fireworks Show. I’m sure other small towns in America hold the same style of fireworks show ours is especially unique because we’re in a canyon, every boom echoes for miles. It’s also nice to listen to the the crowd always cheering and very impressed with each firework that is set off. Yeah the big cities might have the musically choreographed productions and hour long fireworks shows but nothing compares to seeing the fireworks in Orofino and listening to the echoes down the Clearwater Canyon. One of the benefits to living in Idaho or anywhere in the along clearwater national forest in the northwest is that the the forest is right out your backdoor. This holiday we had everyone camped out in our house and in a tent camper in the back yard. It’s truly amazing to have quality time to just sit and tell stories around the campfire even if its in your own backyard. But if you’re ever wanting to camp in Idaho, you’re welcome to visit us, but you’ll have to stay at our local campgrounds there is Pink House Hole , it has amazing river views, is the first campsite when you arrive to Orofino. There’s also a campground pretty much downtown called Clearwater Crossing, riverfront parking and right by the park. Photo: S’more time with the kids, here is how easy it is to use the rolla roaster, high quality, USA made, camping fork that is good for the whole family. Please do look us up and come see where the Rolla Roaster is made if you happen to come through town! Have a great summer and 4th of July! Also if you don’t have any Rolla Roasters yet! This month we’re running a special where we’ve lowered all our prices and have free shipping for orders over $30.